Boneless spare ribs are a staple of many Chinese restaurants, as the ribs provide a rich, meaty flavor and are packed with protein. While boneless spare ribs can be an enjoyable treat, they aren't ideal for your overall health, as they tend to be high in calories and fat as well. 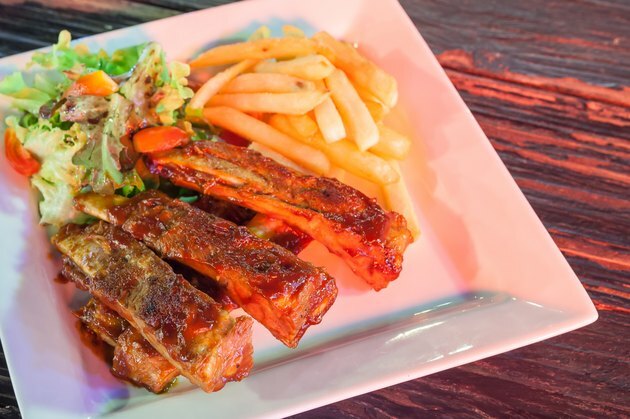 Spare ribs served at different restaurants may have variances in nutritional information due to differences in recipes. If you're dieting, Chinese boneless spare ribs aren't an ideal choice; an 8-oz. serving of the ribs contains 949 calories, which comprises more than 47 percent of the daily recommended intake of 2,000. Eating high-calorie meals can make weight management difficult, and it would take a long time to burn the calories through exercise. You'd have to jog for an hour and 38 minutes or swim laps for an hour and 51 minutes to burn 949 calories. Chinese boneless spare ribs are high in calories largely due to the significant fat content. Each 8-oz. serving of this food contains 74 g of dietary fat, which is equivalent to the fat content of about 16.5 eggs. Your body does need dietary fat to survive, but it is high in calories, so eating a lot of fatty foods can make weight management challenging. Chinese boneless spare ribs are a rich source of protein, with 56 g in each 8-oz. serving. Protein builds and maintains the cells and tissues of your body, so eating adequate levels is essential for proper health. You'd have to eat more than nine eggs to obtain the amount of protein in 8 oz. of Chinese boneless spare ribs. While Chinese boneless spare ribs are high in other nutrients, they are low in carbohydrates. Each 8 oz. serving contains just 13 g of carbohydrates, a nutrient that acts as your body's primary source of fuel. You may find success with low-carbohydrate weight loss plans, however; research from the February 2006 edition of "Archives of Internal Medicine" suggests that they can produce quicker weight loss than higher carbohydrate diets. If you're at risk for high blood pressure, eating Chinese boneless spare ribs may not be a good idea, as an 8-oz. serving contains 1,251 mg of sodium, which comprises 83 percent of the American Heart Association's daily suggested intake of 1,500 mg for all persons, regardless of health status. One benefit of Chinese boneless spare ribs is the rich potassium content. Each 8 oz. serving contains 794 mg, or about 40 percent of the daily suggested intake of 2,000 mg. Potassium ensures that your muscles, nervous system and heart function properly. Chinese boneless spare ribs aren't particularly rich in vitamins and minerals, but an 8-oz. serving does provide 20 percent of the daily suggested intake of iron. The serving also contains 4 percent of the suggested daily intake of vitamin C and 3 percent of the daily suggested intake of vitamin A.